The DAO.Casino project is dedicated to creating a universal protocol for online casinos based on blockchain technology. The goal of the project is to make participation in the online gambling business more beneficial to all parties included. Before you is our carefully researched DAO.Casino review, which aims to reveal all the aspects of the project and explore both the benefits and the methods of participation in the DAO.Casino ICO. DAO.Casino has a great team of over a dozen dedicated individuals working hard on fully developing and promoting the protocol. The members of the team are Ilya Tarutov, the CEO, Konstantin Lomashuk, protocol architect, Alexander Noxon, the CTO, in charge of platform development, Ksenya Bellman, in charge of business development, Alexandra Fetisova, project manager, Sergey Pomorin, game developer, Sergey Lonshakov, in charge of DAO design and implementation, Alexander Krupenkin, solidity developer, Eugene Radchenko, program manager, Alexander Davidov, solidity developer, Alex Kirillov, the CFO, Akbar Murataliev, marketing executive, Stepanchenko Alexander, full stack developer, Theo Goodman, community manager (Germany), and David Choi, community manager (Korea). DAO.Casino’s team of advisors includes Bruce Elliott, Tomoaki Sato, and Eric Benz. DAO.Casino protocol aims to solve the problems and eliminate the flaws currently plaguing the online gambling business, such as the lack of security, the significant risk of fraud, high and/or hidden fees, high costs of running online casinos, and the lack of transparency, as well as restricted access for game developers. The creation of DAO.Casino protocol is a major step toward the establishment of a sustainable system that works in the best interest of the developers using the protocol, who benefit from higher profitability, casino operators, who get to enjoy lower costs, and players, who get better service, more choices, and greater security. Such system would do away with every form of human participation and interference in the functioning and maintenance of the system. The processes would be automated and the software used for automation would be characterized by complete transparency, consistency, and cryptographic verifiability, eliminating the element of trust, which is normally an intrinsic feature of online gambling. By eliminating human actors from the equation, no administrator permissions are needed and the risk of corruption and rigging the results of the draw are also eliminated. Instead of trusting a third party with the management of the processes of value transfer, the online gambling system based on DAO.Casino protocol relies on consistently executed code within the Ethereum network. No external or human factors mean higher security for everyone involved, particularly the players. The very concept outlined in the previous section of this DAO.Casino review reveals the numerous potential benefits of the protocol. DAO.Casino has the power to revolutionize the online gambling business and provide a safer environment and greater profitability to all participants. Although a fee system remains a necessary part of the protocol, unlike in the case of traditional online casinos, there are no hidden fees and the fees are distributed within a hard-coded reward system that is characterized by fairness and equality. The tokens collected through game contracts are distributed to the game developer, the casino operator, the referrers, and the bankroll backers, all of them receiving an equal share amounting to 25% percent of the total number of tokens. Apart from the absence of hidden fees, DAO.Casino also allows the participants to enjoy lower fees. The so-called gas cost associated with the running of Ethereum-based software is reduced by employing a system in which the gas is paid per operation and there are no costs beyond those related to the operations and storage used. This significantly lowers the fees and consequently increases profitability. By lowering the entry level for game developers, DAO.Casino creates greater opportunities for both developers and players. It enables front-end developers to use the existing gambling game smart contracts, allows for easy collaboration with platform operators, lets developers preserve their IP rights, and offers them the chance to automatically receive lifelong rewards. As it becomes easier for individual developers to create new games and monetize their work, players also potentially get to enjoy the possibility to choose from a wider range of games. The key features of DAO.Casino are fairness, safety, transparency, and profitability, all resulting from the smart employment of blockchain technology. If its potential is sufficiently recognized, the holders of DAO.Casino’s BET tokens do not only get to profit by supporting games and getting rewards as bankroll backers but can also take advantage of the rise of the token value in the exchanges into which it will be introduced once the crowdfunding campaign is finished. DAO.Casino launched its ICO on June 29, 2017, at 1 p.m. GMT. The team hopes to raise $25 million during the crowdsale. As soon as the goal amount is reached, the crowdsale will be terminated. The price of the token will gradually increase during the ICO. During the first day of the crowdsale, supporters can purchase 2000 BET tokens at the price of 1 ETH. During the following 13 days, investors are given the chance to purchase 1800 BET for 1 ETH. If the necessary funds are not raised during the first two weeks of the ICO, the number of BET tokens that can be purchased for 1 ETH will decrease by 100 every three days. During the ICO, 70% of the total amount of BET tokens initially released will be available for purchasing. 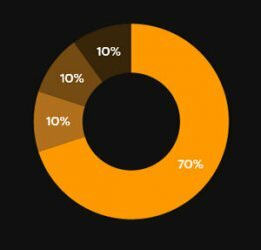 The remaining 30% goes to bounty participants (10%), early adopters and founders (10%), and legal entities (10%). As much as 60% of the funds raised during the crowdsale will go into research and development. Out of the remaining 40% of the funds, 5% will be set aside for legal purposes, 15% will go into marketing, and 20% will be used for operations. Individuals interested in investing into the DAO.Casino protocol can make contributions by using their preferred Ethereum client (e.g. Geth, Parity or Mist) or MyEtherWallet. DAO.Casino has already announced the crowdfunding contract address to which Ether contributions should be sent. It is available on the DAO.Casino website. It is important to keep the private keys for the address used to send contributions safe, as the same address will be used for storing BET tokens. Keep in mind that these instructions should be strictly followed so the contributions do not get lost. Supporters should by no means use Jaxx or multi-signature wallets or send Ether from exchanges when making their investments. Unfortunately, US citizens cannot take part in the ICO. However, once it is over, BET tokens will become tradable and all interested parties will be able to buy them on the secondary market. Satoshi Fund’s DAO.Casino review features information that may be useful to potential DAO.Casino users, as well as the project’s objectives and potential challenges and the advantages that can come with using this platform. DarkNet Guru’s YouTube review explores DAO.Casino in this video, providing you with extra info about the project. It also features a tutorial for the BankRoller app. The official DAO.Casino YouTube channel includes several videos that can introduce you to the platform, provide detailed instructions for downloading and using the BankRoller app, and show you how to purchase BET tokens using supported cryptocurrency wallets. Picolo Research’s review reveals what DAO.Casino may achieve if it succeeds in its endeavors and what kind of problems it might encounter along the way. The review also contains information about its ICO, the project in general, and the company’s commercial strategy. The future of any new project is uncertain, but we have high hopes for DAO.Casino. Apart from being a part of the currently fastest-growing industry of online gambling, it promises great benefits for everyone involved. It is well-designed and wisely makes use of the potential of the Ethereum blockchain in the online gambling business, providing well-thought-out solutions to the problems normally encountered in the world of online casinos. While it may not be the only project of this kind, it is certainly one of the best we have seen so far. It definitely inspires trust and seems to be a rather solid investment. Be sure to give it a look.